We’ve shared many times on Natural-Fertility-Info.com that diet and lifestyle are effective tools for managing PCOS. We’ve also shared that women with PCOS can use herbal therapies to help regulate their cycles, balance their hormones, and improve fertility. Yet, you may be wondering: Where’s the proof? We have some! This article discusses a recent study on PCOS that documents the effectiveness of natural therapies (including diet, lifestyle and herbal formulas) for relieving PCOS symptoms and increasing fertility. PCOS is believed to affect up to 21% of women in their reproductive years. Of those, it’s thought that around 70% are undiagnosed. In talking with women with PCOS about their options, a survey conducted by National Institute of Complementary Medicine, Western Sydney University, Australia research fellow Dr. Susan Arentz (who led the study highlighted below), finds an astounding 99% would prefer alternative therapies to birth control and fertility drugs. Today, some evidence finds around 70% of women with PCOS use complementary therapies. 2 out of 5 also use herbal approaches! Moreover, recent research finds herbs along with diet and lifestyle may be a very good approach to consider for PCOS. A 2017 study published in Phytotherapy Research, studied two groups of overweight women with PCOS. Both groups received a 3-month program, involving 150 minutes of exercise each week, and a low glycemic, high nutrition plan. One of the groups received herbal extracts tailored towards PCOS management containing: Cinnamon (Cinnamomum verum); Licorice (Glycyrrhiza glabra); White Peony (Paeonia lactiflora); St. John’s wort (Hypericum perforatum); and Tribulus (Tribulus terrestris). The Results: Of the two groups, around half of the women given herbal extracts had a regular cycle at the end of the three months, compared to under a quarter of women in the diet/exercise group alone. While both groups showed benefits, the combined therapy group lost more weight; had better hormone test results (including fasting insulin levels); higher rates of conception; and less anxiety, depression and stress. While this was a small study, it’s significant. PCOS is a top fertility challenge, and seeing natural therapies at work is very encouraging. You can reduce your symptoms, ease stress, and increase fertility with PCOS by making diet and lifestyle changes. For women who want to increase these benefits, learning more about herbs to help manage symptoms is another great option. A challenging diagnosis like PCOS doesn’t exist in a box. There are many types of PCOS and the woman experiencing it have their own unique differences. In addition, not every fertility herb addresses PCOS. 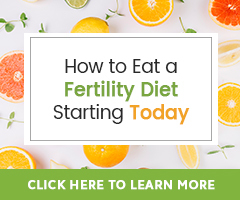 It’s best to have guidance from a qualified naturopath or Fertility Herbalist to help you develop a natural fertility program that is well suited to your needs. If you have PCOS and have already started a PCOS Diet and program, stay patient and be kind to yourself! It can take time to see the benefits of natural therapies for PCOS (sometimes 6-10 months). Feel confident that the changes you’re making are helping. Know the improvements in your overall health and fertility will be well worth it.